عندما تزور هذه المدينة رائعة الجمال، ستشعر أنك في بيتك في The Boutique Collection at Port Heritage Hotel الذي يقدم لك إقامة متميزة و خدمات عظيمة. يجذب هذا العقار ذو 4 نجوم، والذي يبعد 1. Km فقط عن وسط المدينة و 66. Km عن المطار، الكثير من الزوار سنوياً. إن سهولة الوصول من الفندق إلى المعالم السياحية الشهيرة الكثيرة في المدينة هو استثنائي بحد ذاته. يقدم The Boutique Collection at Port Heritage Hotel خدمات لا غبار عليها وكل أشكال اللياقة وحسن الضيافة اللازمة لإسعاد ضيوفه. يقدم العقار مرافق مخصصة لذوي الاحتياجات الخاصة, تسجيل وصول/خروج سريع, تخزين الأمتعة, صف السيارات, التوصيل من وإلى المطار لضمان الراحة القصوى لضيوفه. تتضمن كل غرف النزلاء وسائل الراحة والتسلية المصممة خصيصاً لضمان الراحة القصوى للضيوف. كما أن مجموعة الخدمات الواسعة الموجودة في الفندق لضمان راحتك تترك لك الكثير من الخيارات لقضاء وقتك أثناء فترة إقامتك. إن The Boutique Collection at Port Heritage Hotel هو خيار ذكي بالنسبة للمسافرين، فهو يوفر إقامة هادئة ومناسبة للاسترخاء. يُرجى العلم بأنه يتم توفير خدمة الغرف مرة واحدة فقط كل 8 أيام. ويمكن الاتفاق على توفير خدمة الغرف بمعدلات إضافية أثناء مدة الإقامة مقابل 40 دولار أستراليًا. The apartment was right in the centre of MacCrossan Street and all the restaurants. It had a huge kitchen, very comfortable bed, lounge area and balcony. It overlooked the main street and not the pool area. There was a lift to this particular unit, but there isn't a lift to all apartments in this complex and the stairs are steep. We didn't use the pool but it was a gorgeous looking pool area. There is no restaurant/dining option at the hotel. Location, Clean, Spa Bath on Balcony! The people at the Boutique Collection really looked after us and would highly recommend them . Great, we would return to the same unit at the hotel for any stay. Very central, yet, quiet. Well looked after, in a very good conditions. We were very surprised to be upgraded from Studio to 1-bedroom appartment. After all , it's busy time (July) - school holidays. We liked it very much - big, airy, huge balcony with the view on a lagoon pool and a corner spa. Fully equiped kitchen, in-house laundry, plazma TV, DVD player etc. Check-in and check-out didn't take much time at all. They booked for us a shuttle bus to the airport (cheaper rate). 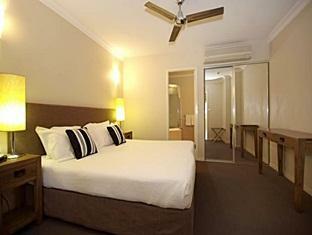 i booked this room last minute and therefore arranged my own transportation form the cairns airport. the staff at the reception was very friendly and helpful. i had a studio suite which was upgraded to a 1 bdrm . there was a flat barb-b-que on the balcony and the outdoor bath. 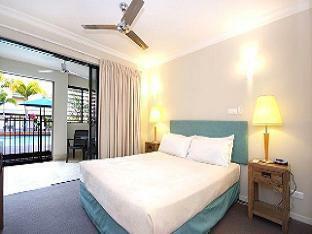 it was raining everyday in port douglas so i never used the pool. this was an average accommodation. Stayed here for a few nights in February. Rooms are very large and the washroom is a good size as well. Our room had a balcony, outdoor hot tub and barbeque. It was really hot during our stay so we never used the hot tub, it also didn't look that clean also. There is a Coles supermarket next door which is great for saving on eating out costs. The prices at restaurants are insanely expensive in this area. The hotel has a large pool area and common bbq area. If you stay here I would choose a room not facing the pool as this area can get quite loud with people swimming and drinking. The hotel staff leave at 5pm so if there are issues you'll have to deal with them. Also you are in a tropical area so don't be surprised to see bugs like cockroaches or spiders in your room. We kept the balcony door closed but we still saw some spiders and other bugs in our room. we just loved this hotel, the room and bed were huge, it was beautifully appointed, clean, had everything we could need in the kitchen and even had it's own laundry. it was the best accommodation we had on our trip. highly recommended. 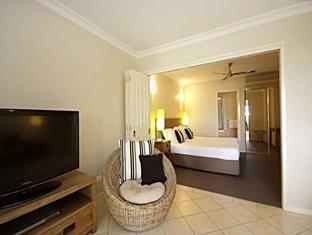 we stayed at the mantra in port douglas. the apartment we had was fantastic and great value for money. the balcony from our apartment had a spa tub and bbq on it. there was a kitchenette which could have had more utensils in it to make bbq-ing and cooking easier but other than that the place was excellent. the grounds of the hotel were lovely, particularly the pool area. Port Douglas is a beautiful holiday destination, the beaches are amazing, the cafes and restaurants fantastic, but check the prices where you eat. The Sunday markets along the beach are full of treasures, jewellery, art and locally grown vegetables.